On Monday, the film minted Rs 1.84 crore, bringing its total collection so far to Rs 14.71 crore. 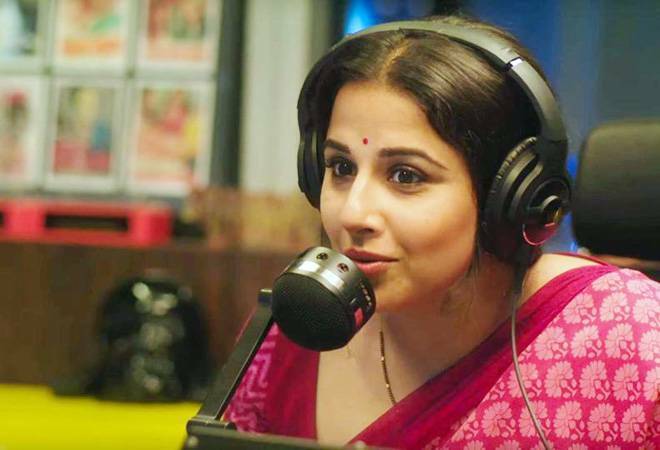 #TumhariSulu Fri 2.87 cr, Sat 4.61 cr, Sun 5.39 cr, Mon 1.84 cr. Total: â‚¹ 14.71 cr. India biz. #TumhariSulu had a SUPER-STRONG weekend... Showed SUPER trending... Fri 2.87 cr, Sat 4.61 cr, Sun 5.39 cr. Total: â‚¹ 12.87 cr. India biz. The film is about a hard-working and happy-go-lucky housewife who lands a job as a night radio jockey in a leading radio station. Tumhari Sulu is a fine blend of comedy and drama and revolves around how Sulochana tries to maintain a balance between her new-found work life and household responsibilities. Not only that, she tries to cope up with her husband's insecurities as well after he struggles to make a place for himself at his workplace. Vidya Balan and Manav Kaul's chemistry acts as a booster for the film. Since the release, Tumhari Sulu has received appreciation from both critics and audiences. Critics have mentioned that Manav Kaul is a delight to watch and that his performance makes the character of Ashok stand out in a film dedicated to a female lead. Film critic, Lakshana N Palat wrote in India Today, "The best part of Tumhari Sulu is that all characters have been written well, and don't just sit on the sidelines, waiting for their next dialogue. Neha Dhupia is surprisingly good as the tough boss, which just shows that all she needed, maybe, was a good director. The songs have a vintage charm to them and add to the overall pleasant effect of the film. The film is of course, far from perfect. It is in no hurry to quicken its pace, and one can't help but wish at points, that it did. Some depictions of the middle-class family are unnecessary and could have been cut out. There are a few cringe-y bits in the end, and the solution to some problems come a little too easy." What remains to be seen is that how the film performs on weekdays and whether it manages to keep its collections consistent throughout the week.